Creating true change within your sales team takes more than a set of spreadsheets and a simple day of training. A sales transformation can’t and shouldn’t happen overnight. It’s a process. Picking the right partner is a key component to driving success. 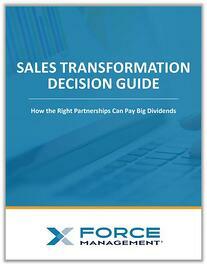 Our Sales Transformation Decision Guide outlines why a partner perspective can help you drive results, and provides tools and techniques to help set you up for success. Take a look, and see how working with Force Management will produce measurable results for your organization. Fill out the form on the right to download your guide today.